Yes, we've given www.bordenflyingclub.com a minor facelift, if you're visiting our new website for the first time, welcome. The previous version of the website has served the club well so we've made sure all the same features are still available, they're just in different locations. As we progress, tweaking and fine-tuning the website based on feedback, it should continue to evolve and improve. The major differences you'll find with the website, other than the layout, are the club message board and the online e-store. Although they are in different locations, navigation-wise, fundamentally they operate the same as they did before. During the update it made good sense to fold the Message Board and Pilot Shop's web-management tools into the website content management system thus making it easier for non-programmers to run the website. As a result of the migration to the new software anyone who had previously purchased on-line or had signed up to the message board will need to do so again…. our apologies for the inconvenience. The newsletter archive, as of March, has moved and is now found on the public website. Speaking of newsletters, all members and non-members who had subscribed to the club newsletter are still subscribed, no need to worry about not getting your copy of the newsletter. 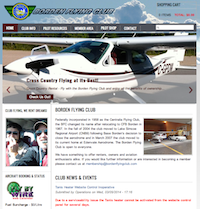 If you were previously subscribed to our Newsletter AND you are a Borden Flying Club member and you wish to login to the public website you will need to create an account on the new website first. Without an account on the club website will not be able to post on the Message Board. Creating an account is easy, use the link supplied or go to the Message Board/Store Login at the lower left of the page and select create an account. Follow the instructions in the e-mails you'll receive. The Member's area and the Fly by Wire booking and events calendar is completely unchanged. Any member needing to update personal data or make bookings should use the Member's Area link at the top of the page or the Fly by Wire button on the left-hand side. We hope you find the website easy to use and please, if you have any comments or feedback, or notice issues with the website please email your Webmaster with the details.